FLOKK (eng. HERD) is a series of 21 tall, narrow figures cast in bronze with glass eyes created by Gitte Dæhlin. 21 figures cast in bronze look out over the river Gudbrandsdalslågen from a field near the medieval farm Sygard Grytting in the municipality of Sør-Fron, Norway. Visitors to the farm might expect to see a herd of sheep grazing but see instead a group of tall elegant bodies. The figures have glass eyes. They appear relatively similar, but at the same time different. They form a group and each one is unique. Dæhlin hopes that the figures will spark our curiosity and set in motion our thought processes. Dæhlin is known for creating sculptures that are rich in color and textural effect, both expressive and suggestive. FLOKK was made in Mexico. The figures were molded in clay with steel reinforcement. Wax castings were produced from the clay figures. Finally the sculptures were cast in bronze. Upon completion they were shipped to Sør-Fron where they currently stand looking out over the landscape and the river Gudbrandsdalslågen. Dæhlin was a Norwegian artist. She lived in Mexico for several periods in 1978 - 2012. Inspired by the Native Indians she made busts, sculptures and heads from organic materials, such as boiled palm leaves mixed with glue, paper and chalk. Dæhlin also worked with drawing and painting. Dæhlin passed away 2. december 2012, only 56 years old. Sparebankstiftelsen DNB is grateful for the opportunity to work with this remarkable artist. Sør-Fron is a municipality in the county of Oppland, Norway. The municipality extends on both sides of Gudbrandsdalen, from Rondane in the east to Valdres in the west. 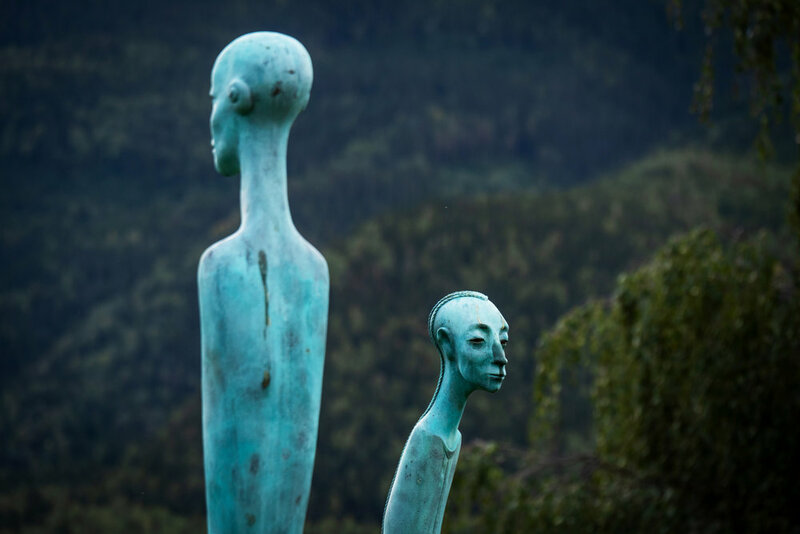 The landscape of Sør-Fron is quite different from that of Mexico where the sculptures were created. Gitte Dæhlin feels, however, that there are similarities, like for example the surrounding mountains. She also sees cultural similarities, for example in the music and the myths. She is pleased with the location of the figures in Gudbrandsdalen.